Alpha Barry flows safely through the center of Barcelona. No driving a large displacement bike or the latest model of car, but everyone looks at him. He pedaled with agility and, despite the traffic, delivers timely fruit and organic vegetables that customers have ordered via on line, to Verdallar. Barry is working on this project two days a week. Start his day reviewing the invoices and orders: after march towards Vall d' Hebron, where they store, and prepare the baskets then shared with the electric tricycle. Verdallar is one of the participants in the Humana 2013 Social Agriculture Program. Since 2012, the Foundation develops in Catalonia this project, part of the experience in agricultural projects carried out in the South. The objective is clear: to support through funding and technical assistance to Catalan organizations working in the fields of agriculture and social exclusion. 11 initiatives are supported by Humana so far. More than 1,100 people are involved. Humana has collaborated in 2013 with eight of them, including the Verdallar. *City of L'Ametlla del Vallès: based on the participation of groups at risk of social exclusion has worked in organic food production to generate quality and dissemination of knowledge of local varieties. In total 215 people have participated, from young adults and older people. *City of Valls: agricultural training for people at risk of exclusion municipality has created a structure for generating proximity agricultural products. Altogether 80 people participated. Job creation is still key in this case as well we have generated 26 labor contracts directly related to the project and 12 more derivatives management. Montse Gutierrez, from Plan for Inclusion and Social Cohesion of Valls City Council, said: "The purpose is not so much the self-production of products but proximity to train attendees in the agricultural sector for future employment. "Burama Fatty, 47, is one of the participants. He said: "I do not know what the future will offer, but I hope that what you learn here will help me to find work". Elouare Mohamed, 54 with seven children, share the desire, after being employed in the construction, agriculture that gives you a job opportunity. He has already completed two courses in the garden, one of which is to grow spring onions, the flagship product of this region. 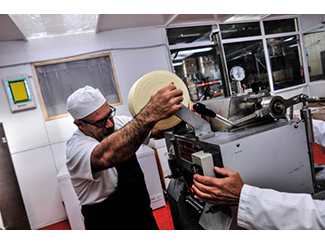 *Foundation Onyar-La Selva: the conversion of special workplace Onyar -La Selva, Girona, has been the first step to launching a new workshop for making fresh pasta. It has also started production of organic food with its own brand, which is being marketed as an alternative to conventional, offering a competitive price for it. A total of 85 people are participating in this initiative. Antoni Ruiz, president of the Foundation Onyar, said: “As a result of the crisis in the fields of industrial nursery manipulated and four years ago decided to convert the activity of our special workplace; so we focus on the cultivation of organic garden and the production of fresh pasta". *Taller de Jeroni de Moragas: training people in risks of social exclusion in areas such as social farming and cultivation of stevia, natural sugar substitute , are the basis of this workshop, in Sant Cugat del Vallès, in which 106 people have participated. 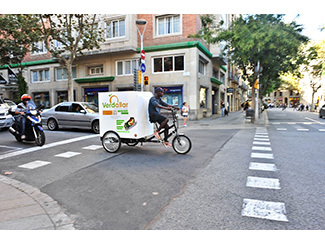 *Verdallar: training, production, marketing plan and incorporating a fleet of tricycles distribution has allowed the company to turn to job placement Barcelona Verdallar in organic agricultural food producer. As a result they have also created new jobs. Verdallar achieved seal Proximity Sell Food Products Catalonia. 30 people involved in the project. *Xicòria: this community of shared economy Montblanc has worked with the support of Humana, in community development of various social orchards of the locality. This has created a space for exchange and knowledge, which has involved numerous agents of the town, beyond the 12 participating families. *Association of Friends of the Botanic Garden of Barcelona: improving production of the garden of the historic garden of Barcelona and diffusion obtained seed bank, while achieving train six participants have been key achievements in this initiative. *SEO/Birdlife: insisting on aspects such as training, organic production and evaluation of culture viability with manual techniques and integration of people with disabilities has contributed to the recovery of rice traditionally. Altogether has 500 people involved. The work Humana conducted in the field of social farming has been collected by the other organizations , the study ' The social farming in local development and employment for groups at risk of marginalization ', prepared by the Universidad Autonoma de Barcelona, and the Cedricat Foundation and RecerCaixa. Specifically, the report includes examples of good practice projects Verdallar, City of Valls, Onyar-La Selva Foundation and Jerome Workshop Moragas.